We hope to translate results from work probing the role of organelles and metabolism in the cellular response to an understanding of how human metabolism influences the progression of infectious disease. Intracellular pathogens depend on their hosts for metabolites essential for growth, and therefore compete with host metabolic processes for a limited set of nutrients. Key players in this competition are the host organelles that store, breakdown, utilize, import, and export specific metabolites. We have recently defined one example of organelle vs. microbe competition: during infection, the human parasite Toxoplasma gondii exploits host lipophagy to gain access to cellular fatty acids essential for its growth. To counter this, host mitochondria fuse during infection to enhance fatty acid uptake, limiting Toxoplasma access to a key host resource and thereby restricting its growth. 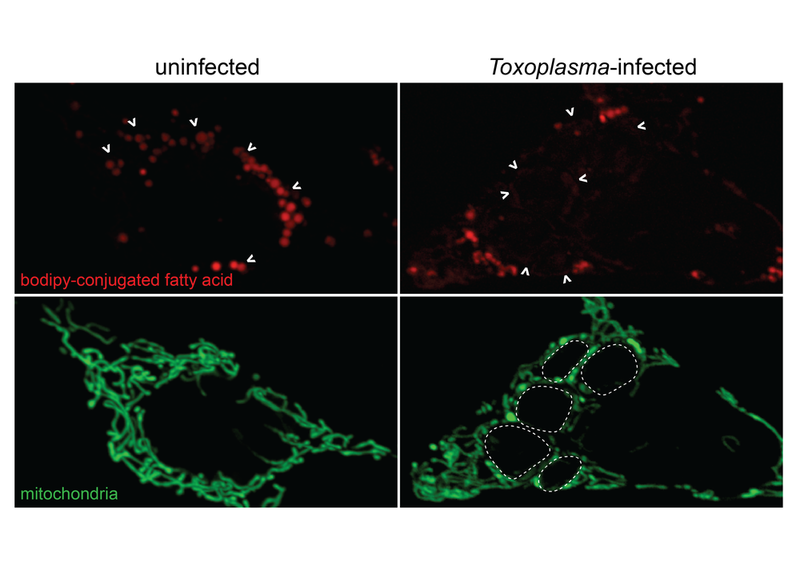 Pulsed fluorescent fatty acids (FAs) remain largely in lipid droplets in uninfected cells but increasingly accumulate in mitochondria (indicated by white arrowheads) at early stages of Toxoplasma infection (parasite vacuoles indicated by dashed lines). How do organelles sense and respond to pathogens? We have defined a host metabolic mitochondrial response to Toxoplasma, but we know nothing about the signals that enable mitochondria to sense and metabolically respond to Toxoplasma. Furthermore, we suspect that other organelles are capable of sensing and responding to pathogens. For example, lipid droplets, peroxisomes, and endoplasmic reticulum traffic to and surround several intracellular pathogens. We seek to understand the pathways that orchestrate how these organelles respond to microbes, and define what role they play in the cellular response to infection. Do cells rewire their metabolism to preempt pathogens from accessing essential nutrients? Uninfected (left) and Toxoplasma-infected (right) adipocytes. 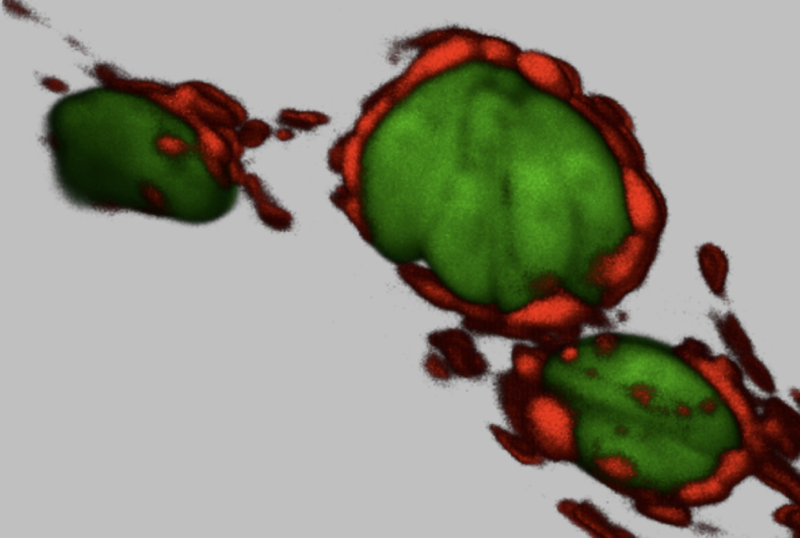 Parasite vacuoles are pseudocolored red, scale bar 5um. 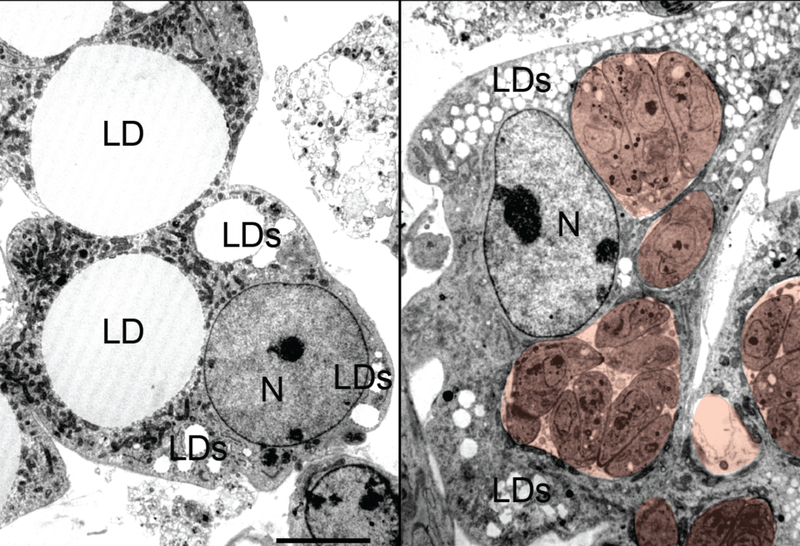 N-nucleus, LD-lipid droplet. If an intracellular pathogen’s access to nutrients can be limited by host metabolic processes, one logical prediction would be that host metabolism is actively rewired as part of the cellular response to infection. For example, to increase the efflux or limit the import of nutrients important for microbial growth. We will define the set of host metabolic pathways that impact the outcome of infection and dissect how the rewiring of these pathways modulates parasite growth. We are also interested in understanding how the cellular responses to infection differ in metabolically diverse tissues, such as skeletal muscle, where Toxoplasma can persist for life. What is the secret of Toxoplasma’s metabolic success? Toxoplasma is auxotrophic for several metabolites, yet manages to proliferate in wildly different metabolic environments (practically any nucleated cell in a range of diverse mammalian hosts). We will define the machinery Toxoplasma uses to sense and adapt (e.g. effector proteins that enable scavenging of host metabolites/modulate host metabolic processes). Defining this machinery has the potential to reveal metabolic Achilles’ heels of the parasite amenable to therapeutic targeting.